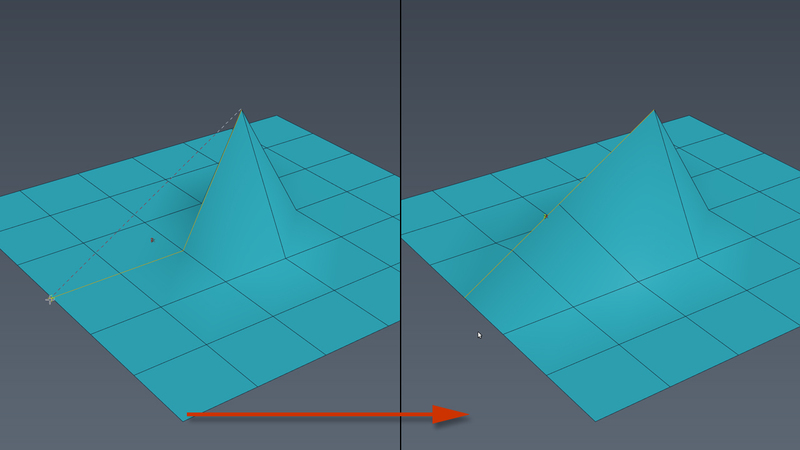 Straighten Edge – 3dsmax maxscript, allows you to align the vertices / edges in a straight line, which is given by two clicks. Render Region – 3DS MAX scripted RenderEffect. Some of renderers such as Arnold or Mental Ray after render finished clear outside area, so you lose previous rendered parts of image in VFB. Render Region restores cleared area of last rendered ….. Here is the demonstration of possibilities of maxscript, which I have worked out while creating hair animation for video, where Veda dances Ballet. This script optimizes the work for setting up Flex modifier in the case, when Flex is used for generate dynamics of objects out of massif of splines. In this article I’d like to go back to the trend of previous years – Lit Spheres materials (also called matcap/Spherical Environment Mapping (SEM), etc.). The essence of this material is that all shader parameters: color, reflections, and so on are located on the image, where the sphere is depicted. To use such a image as material you will need a special shader which can draw out from it the necessary parameters. This kind of materials are very useful in modeling (especially organic objects) and allow to identify errors in the topology. 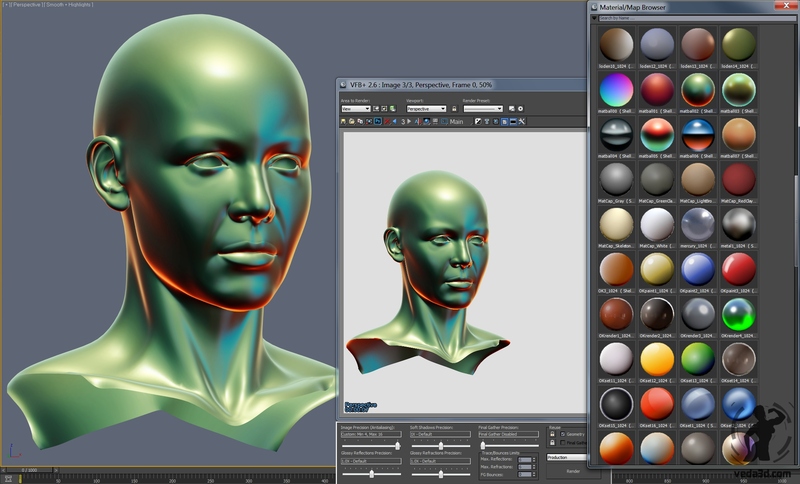 They have proved themselves in programs such as Mudbox and Zbrush. Presence of the library with such materials and possibility of fast switching between them considerably lighten modeling. Just creation of Lit Sphere materials and library with them in 3dsmax we’ll do now. In the process of creating rig of knee it dawned on me that the MuscleStrand lacks one important feature – the possibility of expanding the muscle when it is bent. In the area of the joint there is multilayer structure of muscles, and while it is bending some muscles are contracting increasing in volume. Stratifying on each other, displacing and contracting muscles give visual effect of extension of adjustment tissue by knee and elbow joints. It is hardly possibly to create anatomically right muscle structure using MuscleStrand. That’s why I have replaced the whole group of muscles by MuscleStrand object extending it if necessary. 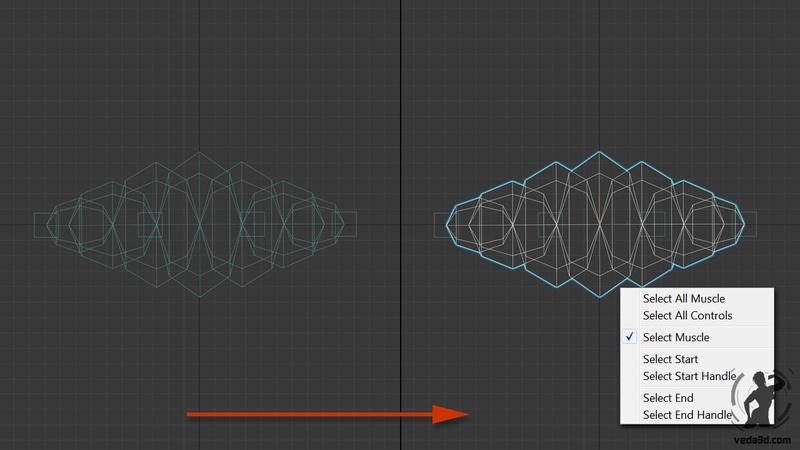 PushByAngle – 3dsmax’s MAXscript modifier allows to “push” object vertices outward or inward along the average vertex normals on the value which is calculated from the angle of two chosen objects. PushByAngle extended version of 3dsmax’s Push modifier. Modifier support any kind of geometry objects. Poly Loop Soft Select – 3dsmax MAXScript, allows when working with Editable Poly object in Edge sub-object mode filter Soft Selection by selected edge’s loop. I ran into the problem of transfer of point cache data from Softimage Face Robot in 3ds max, 3ds max has in world coordinates Z-Up axis, while Softimage Y-Up axis. If you are writing point cache data in Softimage and then try to load it in 3dsmax’s PointCache modifier, then after the data is loaded (because mismatch axes) coordinates of the vertices are not correct and the model will seem inverted. This can be done manually using the snapping. To automate this process and avoid errors when working by hand, I wrote a small script that you can use in this situation. I wrote maxscript snippet which allows bake animation from biped’s head when biped’s head animated through biped’s “Look At” controller. 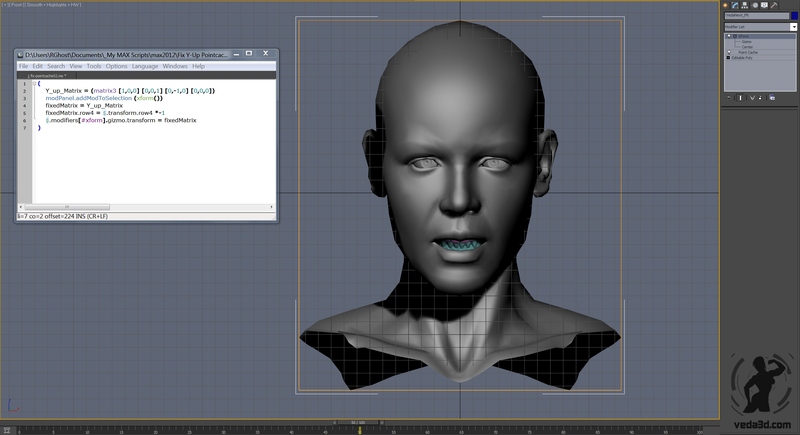 Script bake biped head’s animation and then removes Look At Target.